The Melbourne branch of Accuweigh recently sold an industrial checkweigher to an organic recycling company in Victoria for checking the weight of a range of blood and meat meal products. 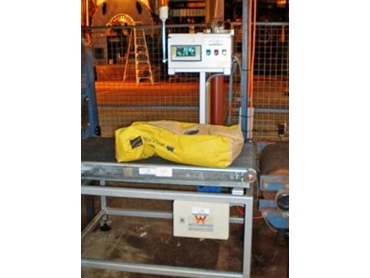 This industrial checkweigher is used on a variety of products packed in 25kg to 35kg capacity filled bags and conveyed from an existing bag filling process at a rate of up to ten bags per minute. Accuweigh’s Accu-Check inline industrial checkweighers are manufactured in Australia using a variable frequency drive to synchronise the equipment’s belt speed with the existing conveyor line for optimum performance. An A&D Mercury 4404 high speed indicator featuring a multifunction operator display performs all checkweighing functions, showing all relevant information including number of under, over and correct weight bags processed. A comparator light tower indicating red (underweight), green (in-tolerance) and amber (overweight) lights with a reject relay function is also fitted to the industrial checkweigher. A leading Australian industrial weighing company, Accuweigh operates eight branches covering all mainland states and providing Australia-wide sales and product support on industrial checkweighers, retail and industrial scales, and food inspection equipment.